Thai food is one of my favourite cuisines as it’s just so full of flavour and many typical dishes use coconut milk (and not cream or yogurt) to give them a creamy texture, which is a big tick in my book! I’m partial to a Thai green curry when we go to our local Thai restaurant, but this isn’t super often (I much prefer cooking at home to eating out, and so does our bank balance I suppose) so I’ve been busy creating my own version which is just as yummy but lots healthier as its packed with loads of colourful veggies (and uses hardly any oil). That’s the other thing I find about eating out – most restaurants seem to make their food really oily which is weird as you’d never add that much oil to your food in your own kitchen so why do restaurant kitchens have to be any different? Who knows. 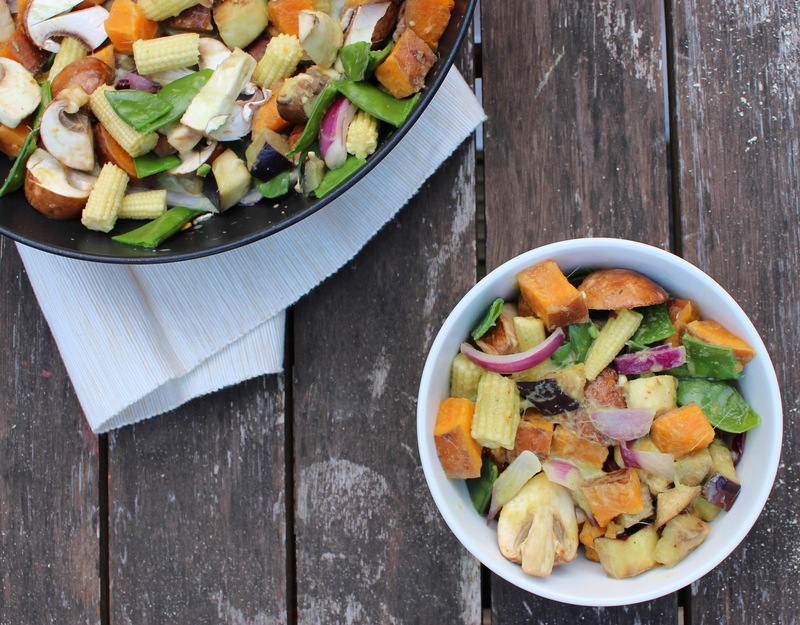 This dish is so fab as you can make a big old batch in one go and you can also jazz it up by adding chicken, tofu, prawns or whatever you fancy if you feel like it. It’s full of a rainbow of delicious veggies, which means you’re basically getting heaps of different vitamins and minerals and giving your body some really great nourishment. It’s definitely made it onto my list of go-to weekday dinners too, and there always seems to be a container or two of it in my freezer! 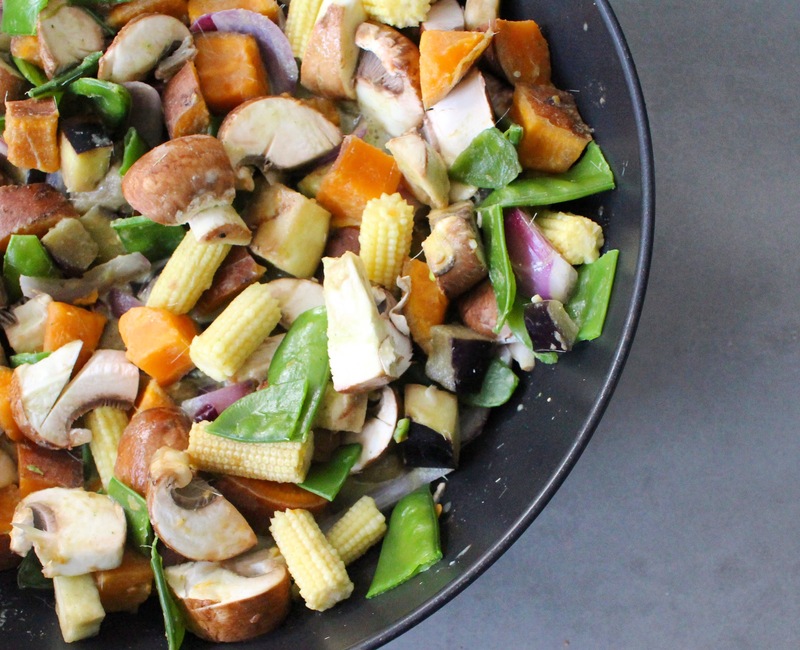 Chop the onions, aubergine, sweet potatoes, mushrooms, mange tout and baby corn into chunks. Add all the ingredients for the sauce into a blender and whizz until they form a lovely green and creamy mixture. Place the sweet potatoes in a large saucepan and boil until they are slightly soft. Add in the mange tout and baby corn and boil for around three more minutes, then drain the vegetables and set them aside. In a wok, sautée the onions and aubergine on a medium heat in the coconut oil. Once softened, add in the mushrooms and stir for a couple of minutes, then add in the rest of the vegetables and the sauce and mix everything together well. Simmer for around five minutes and serve with brown rice or quinoa.